Suka & Spice™: Drugstore Finds! 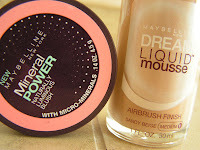 It's hard to see the Adriana Lima advertisements where she sports Maybelline's Dream Mousse foundation, and not wonder...would that really break me out? I'm pretty equal opportunity when it comes to makeup and beauty products in general, but I will admit that there are very few (and by few I mean one) products that do not congest and agitate my skin in the foundation department. It's usually my forehead that bears the pain, and facialist after facialist cannot seem to agree as to why this is. Anyhoot, like I was saying--it's hard to avoid Adriana's big glowing face when browsing in the makeup aisle. Well, she got me. I'm a sucker for good marketing. Almost any sort of marketing, other than the kind that comes along with cheap websites. I picked up a bottle in Sandy Beige Medium 1 (which I later found out, is completely comparable to the shade of Armani's 5.5--ooh my good eyes! ), and then decided to also grab the Mineral Power Blush in Original Rose. The chemist was having a buy one get one 50% off deal, so I figured the time was right. (On that note, I usually try to buy all drugstore items when they're on sale. They're always on sale, and it's a nice break, since higher-end lines virtually never hit a sale phase). The verdict? I am happy indeed! The Dream Liquid Mousse (note: I hear the liquid is light years better than the little pots of mousse that are sold directly next to it), as with all foundations will forever be compared to my beloved Armani. I'm not the girl who will be able to tell you what shade I am in MAC's Studio Fix, because I'll never go near the stuff again. So, in comparison to Armani, there is a bit more coverage and the formula is not quite as moisturizing. This isn't too much of a problem, as I always apply quite a bit of moisturizer prior to any sort of foundation. It's best applied with a brush (such as the MAC 187), as you don't want it to sit heavily too long in any one spot. Once blended, it provides a nice clean finish that I will be happy with while traveling, or on my redder days. Best thing about it? No breakout! The blush however beats out the mousse in my eyes. It's so blendable and natural in its effect, that even if I'm short on time, I know I'm still good to go because there are no harsh lines. I fully intend to pick up the other shades in the near future. However, I've been attempting a sort of Project 10-pan-esque operation, and am far from reaching my goal. Although I'm resisting purchasing new makeup at this time, all bets are off once I reach the duty free zone, en route to Brazil. So sorry, but I can't help myself. That's good news..I'm glad u like! Adriana always looks amazing. It's sad how were easily influenced! I can never resist duty free too, I wish I was going to Brazil :) Have fun! I bought the foundation purely because of Adriana Lima and now I actually write reviews on how much I love it!